Use Jobe’s Organics Fruit & Citrus granular fertilizer with Biozome on all fruit and citrus trees and plants. The Jobe’s Biozome advantage for organic gardening: improves the long-term soil quality of your garden, increases root mass, promotes plant growth and helps your garden resist disease, insects, drought and other unfavorable conditions within a growing season. Delivers long-term benefits without chemicals. Jobe’s Biozome is a unique and proprietary blend of beneficial microorganisms Archaea, Mycorrhizal fungi and healthy bacteria. Archaea, a recently identified microorganism found in some of the planet’s most extreme environments, such as hydrothermal vents on the ocean floor. In garden applications, scientists have discovered that these microbes actually clean the soil, returning it to a healthier, more natural state. Jobe’s Biozome contains a proprietary species of Archaea that quickly breaks down complex hydrocarbons and minerals into basic nutrients and trace elements that plants readily absorb. Mycorrhizal fungi expands the surface-absorbing area of the roots by 100 to 1,000 times, sending out filaments that act as extensions of the plant’s root system, helping plants absorb more water and nutrients. In return, the fungi receive essential sugars and other compounds from the plant roots, fueling their own growth. Finally, the healthy bacterial strain in Biozome improves the soil structure and quality, keeping nutrients near the roots. 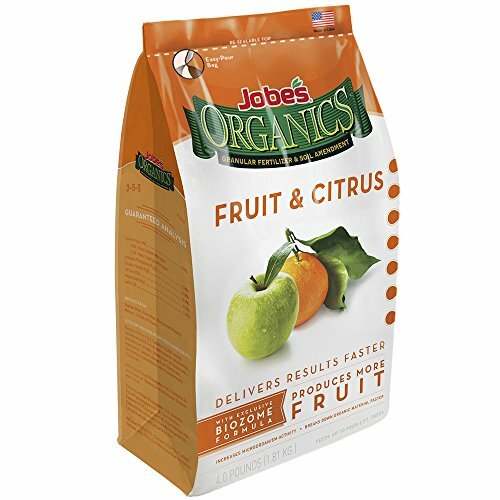 Jobe’s Organics Fruit & Citrus granular fertilizer is OMRI listed and may be used in certified organic food production according to the USDA National Organic Program. Jobe's Organics Fruit & Citrus fertilizer is also available as an organic fertilizer spike for both container and inground citrus trees. Jobe’s Organics Fruit & Citrus Fertilizers will help your trees thrive. Safe for use around children and pets. If you have any questions about this product by Jobe's Organics, contact us by completing and submitting the form below. If you are looking for a specif part number, please include it with your message.